Confident Best!, Issue #2: What's the Easiest Season for Getting Fit? Hope you’re easing gently into the change of seasons and getting excited about the challenges ahead for the coming year. In celebration of my 40th birthday, I recently had the pleasure of taking a women’s surfing safari trip in Mexico that was a wonderful, yet challenging, adventure. I wanted a meaningful journey, so I intentionally chose a trip that would push me out of my comfort zone. 18 women from all over the country spent a week together learning to surf from a talented crew of all female instructors. Surfing scared me (I’m a boogie boarder at heart), but the trip itself sounded so magical and unique I knew I just had to try it. I’ll admit it – my anxiety got the best of me more than a few times. Throughout the trip I practiced that high-wire balancing act of knowing when to honor your fear and when to push through it. Confidence building? You betcha. I was proud of myself for risking discomfort/fear and for gently easing forward. The women I met inspired me and I find myself quietly dreaming of when I can make it back down there for another go at that warm salty heaven. P.S. They even had cafes in Mexico that offered green smoothies, carrot juice, beet juice, and other healthier options. What a surprise. Nothing hits the spot after swimming like a fruity and refreshing green smoothie YUM! It’s almost here! My book, Bellyfire! Sparking Your Healthy Eating & Exercise Motivation is coming out next month. It’s a custom guide and workbook that helps you discover your unique motivations so you can get fired up and remotivated whenever you need it. A workshop will follow in early 2010. Keep your eyes peeled for an announcement in the next newsletter! Could Winter Be the Easiest Season to Get Fit? So many of us dread winter when it comes to losing extra weight or keeping it off. Seems like a challenging time to improve our health in some ways as it’s colder, darker, and full of food temptations, right? I’ll agree with you on the holiday temptations and urge to carbo-load. But, strangely enough, I’ve come to see winter as a blessing when it comes to keeping fit. When it’s time to hunker down from the cold and rain and head indoors, a few things tend to happen that can be extremely beneficial for making diet and exercise improvements. We stay home and eat in more. This means we can control what we eat better as we probably aren’t eating out as much. Making smart choices and knowing what’s in our food is easier at home. Our schedules become more predictable. We don’t go out after work as much. It’s easier to create a routine that we can stick to without as many social interferences and events popping up. We know there will be food temptations. The upside? The advanced warning! Knowing how we want to act and what we’ll choose to do BEFORE the food is offered to us is key. Decide what you want to do and plan ahead. Eat a healthy snack beforehand. Drink enough water. Decide to only eat one of something or to skip it altogether. Making a change to our habits takes energy and consistency for it to stick. And our more regular, home-based schedules can be a boon in getting us moving and grooving and cleaning up our dietary act. As much as I loathe cold weather (I’m pretty sure I’m part lizard), I now look forward to the routine evenings of dancing after work in my garage or office. It’s one of my favorite things to do in the whole world! The dark night, cooler air, and quiet are perfect for rocking out in solitude – a private world away to connect with my body and really get into the music. In summer it just doesn’t happen much – it’s too light out, too hot, or I’m out doing something elsewhere. Take advantage of the blessings of the “quiet season” to recharge your batteries. See if you can find some unexpected perks in the change of weather and schedule that helps you improve what you eat or exercise more often. If working out at home isn’t your bag, find a local gym that offers monthly memberships, an outdoor winter sport you can do often, or pair up with a buddy to use exercise DVDs together or split the cost of a personal trainer. Every season has its place. Much as I love warm weather, perhaps perpetual summer wouldn’t be as fun as it sounds. Maybe us warm-weather folks will even come around to actually like Winter… Anything is possible, even for this lizard girl. I’ll try to keep an open mind. See Lose Body Fat and Get Powerful in Your Life and What Diets Are Best for You? to get your mind chewing about how many delicious options you have for tweaking your lifestyle to make it even healthier. 2010. Doesn’t that sound like a sci-fi movie? In the year 2010, robots ruled the earth. OK – maybe it’s just me. I’ll get used to it eventually. So the future is here again as it always is every second. It will be here before you know it. Where do you want to be in 2010? Take a moment to think about your goals and aspirations. Where is your health at right now? 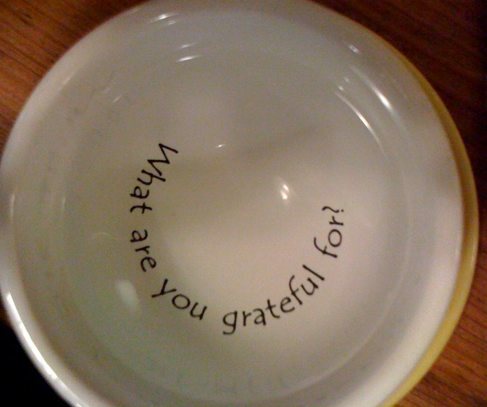 What are you grateful for in your life? What do you want to accomplish next year? How can you enjoy the journey more? Regularly envision yourself succeeding at your goals with your mind. The more you can imagine it, the more you can believe it. And the more you can do it. What would be the most satisfying and fun personal goal to accomplish next year? Why does that goal excite you? The more you understand your “why” the more you can use that knowledge to help you get what you want. What baby steps can you take toward your goal next month? Next week? Today? Keep the steps super small so you don’t resist them (they aren’t threatening) and you keep making progress. Bit by bit, little by little, “poco un poco” as the café owner in Mexico kept reminding me. That’s how we all get anywhere in life anyway, isn’t it? A series of small steps and events and beliefs and attitudes, and ideas that collectively move us forward in life. Take the dream interview to learn more about your dream and how to move forward with it. You really can achieve what you imagine. For more motivation quotes check out Motivation Quotes. Sometimes you just want something creamy, filling, with that holiday spice. Am I right? Luckily, there is a healthy option and it's surprisingly satisfying to drink and easy to make. My favorite winter smoothie recipe reminds me of that nutmeggy eggnog I used to love as a kid (without the artificial aftertaste of most store-bought eggnogs) with none of the processed junk, dairy, and gummy sweetness. Just silky smooth rich green goodness. Leave out the greens if you truly must make it white, but make sure to add that extra banana or less water to your almond milk to make it thicker if that's how you like your 'nog. Sprinkle extra nutmeg sprinkled on the top for that festive look. Have a wonderful month giving thanks and shifting into the more internal time of year. Let your body adapt to the changing weather and honor your instincts to give yourself more downtime during the hectic holiday periods. But don't shelve your dreams until later - continue to make those baby steps on your dreams all year long. You'll keep your momentum going and be glad you're putting energy into what matters to you. Get a free subscription here (top right corner). Sign up and get 10 Questions to Get You Closer to Your Dreams FREE.